The Electric Picture House in Wotton-under-Edge has announced the winners of the photographic competition in a bid to get twelve stunning pictures for its next calendar. The pictures for its last five calendars have been supplied by a handful of very keen supporters of the cinema. 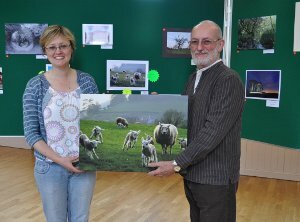 But this year the task of finding photogenic shots of Wotton was opened up to local enthusiasts with Stephanie Toase of Cherry Orchard, Wotton winning the £50 prize donated by Clifton Cameras of Dursley for the best overall picture. The graphics design company Draw Creative who loaned their display boards for the exhibition had a surprise for the winning photographer. They enlarged her picture and printed it on canvas using their new large format printer and presented it to her. Stephanie Toase (2), Maggie Studholme (2), David Sames, James Walshe (2), Rebecca Clarke (2), Janet Walshe, Stephen Vines and Helen Barry. Full details of the rules and how to submit pictures for next year’s competition will appear in due course on the cinema’s website, www.wottoneph.co.uk .